Seeking refuge. Tens of thousands of Gazans have been flocking to the Strip's beaches over the last few days, seeking relief from the sweltering heat during the daily 16 hours in which there is no electricity and therefore no air conditioning. A new class division has emerged with the adoption of the Israeli model of closed beaches, which have turned into status symbols. Parasols and chairs. Beach for the middle-class. 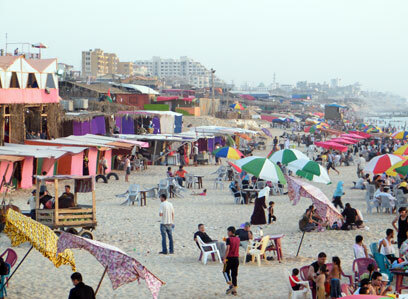 A Beit Hanoun resident told Ynet that he and his family spend the afternoon on the beach, bringing with them food, drinks, and blankets and paying only for the travel fare. However, he noted that his wife's dream is to spend one day in the newly-introduced beach cabins. "You would have to pray to get away with less than NIS 200 ($ 52.53) for such an evening and that's something that few can afford," he noted. 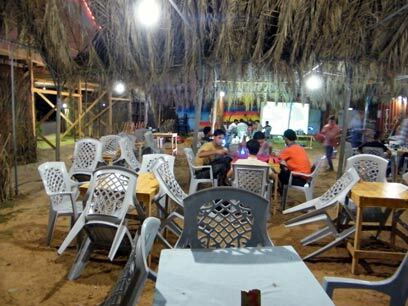 Finally, there are the expensive canopied beaches which offer giant TV screens and a waiter serving food and drinks. "An evening with the family there would cost you several hundred shekels. It’s a distant dream." Consequently, three groups emerged on Gaza's beaches: "The poor ones who sit on blankets with food from home; those who can afford renting out chairs and parasols; and the very few, the spoiled rich, who sit in roofed cabins with giant screens and a waiter serving food and drinks." Gaza municipalities said they are working on enforcing uniform prices for all beaches and will punish those charging more. See all talkbacks "3 social classes emerge on Gaza's beaches "